Mesh bar stools are a good option when it comes to interiors that seek minimalism over anything else. With Mesh materials, you have a piece that appears less bulky and allows natural light to fully pass through it. We’ve all heard how well mesh office chairs are when it comes to placing them in the office. But how well does it fare for bar stools? Firstly we would like to present to you the Marco Mesh Adjustable Bar Stool from Decor8 Hong Kong furniture. Such bar stools like these are great for long social events. Just like the office chair version, this chair provides great ventilation making them an excellent choice. This adds points to its comfort level and also makes for a stylish piece for your interior. The mesh seat is made of breathable elastomeric mesh material which is strong and hard wearing. This seat is available in black, grey, or blue. What we love about this Marco Mesh Adjustable Bar Stool is the shiny chrome detailing around the seat and the metal base. There is even a handle on the back of the seat which makes it easier to move the bar stool or you could even use it to hang stuff on it. Oh and did we mention the height was adjustable? This feature allows it to adapt to its placed location. This fun bar stool will make your interior look trendy and stylish. Perfect for homes, offices, or business establishments. The simplicity of the design allows the bar stool to blend in seamlessly into any modern interior. Don’t believe us? Come and pay us a visit in our Wan Chai showroom to see it with your own eyes. You could even test it out whilst you’re there. 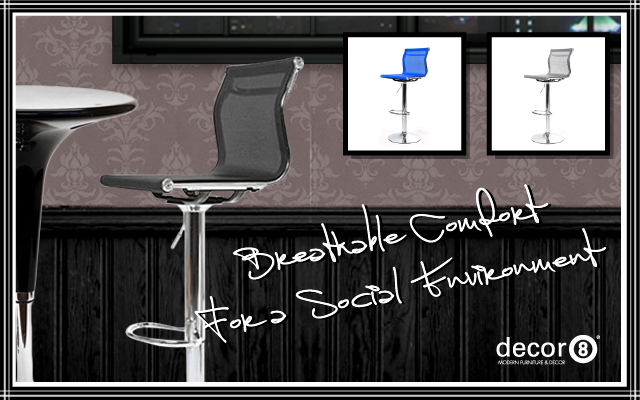 This Marco Mesh Bar Stool is worth considering if you’re looking for breathable comfort for a social environment. This entry was posted in Barstools, Seating and tagged adjustable, aluminum bar stools, bar design, barstool hong kong, breathable, chairs hong kong, contemporary mesh bar stool, counter, decor8 furniture, kitchen, mesh, mesh bar stool, modern design, stylish bar stool, trendy bar stools.